I typically work four days a week, with the occasional fifth day if it's a busy week with a lot of extra work. That being said, four days a week I usually have breakfast on the go. The two days I babysit, I'll have an apple on my drive to the house and will make myself something there. The two days that I'm in the office, I'll grab a Poptart and some fruit to eat at the office. However, on that one day off, I take advantage of sleeping in and normally get up around 10:30. Usually by then I'm pretty hungry and am excited to be able to eat real breakfast food as opposed to a warm Poptart on my morning commute. The one thing that I LOVE making on lazy days where I don't really have anything to do (or if I do, it's later in the evening) is smoothies. These are the easiest things in the world to make and they're delicious, filling, and healthy. 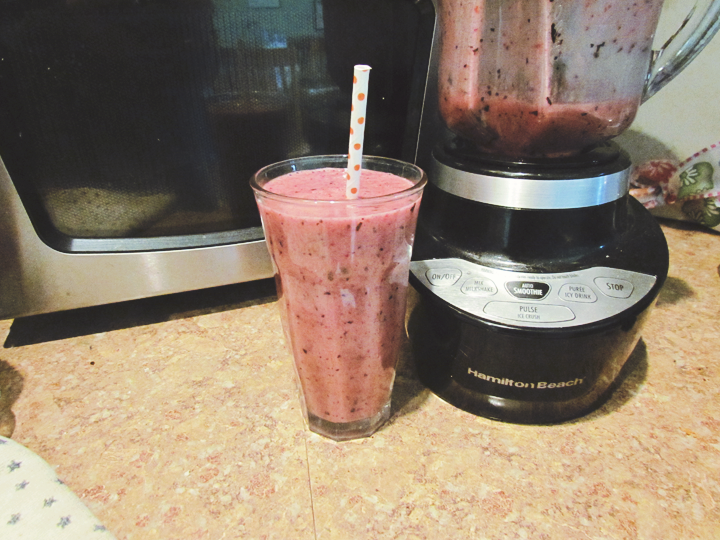 Nothing makes me feel better in the morning than a fresh smoothie. I like to make mine with strawberries and banana. If I have any other berries in the fridge or freezer, I'll throw those in for good measure as well. To make the smoothie thinner, I'll use Mots for Tots apple juice because it's less sour than orange juice and has 40% less sugar than regular apple juice. Okay, and it's amazing and I like to just drink it on its own as well. Then I blend it all up and voila! Another breakfast favorite of mine is eggs. I like them scrambled, fried, sunny side up, every which way you can think of. I don't eat enough protein my diet, but on the days that I eat eggs for breakfast, I feel like I eat enough to supply myself with protein for weeks. Seriously, I love eggs. Sometimes we have bagels in our house and those are always a nice treat for breakfast. I missed bagels from home because I swear the bagels in New York are like ten times better than bagels anywhere else. And the bagels in NYC are infinitely better than the bagels at home. It sounds like I'm having a romantic love affair with bagels, but I promise that I'm not. What's your favorite thing to eat for breakfast on a lazy day?